The payload dispenser and its six Globalstar second-generation satellites are lowered to the horizontal position (photo at left) in preparation for its integration with the Soyuz payload fairing (right). This activity occurred in the Baikonur Cosmodrome’s Upper Composite Integration Facility. The next cluster of second-generation Globalstar satellites to be orbited by Arianespace is ready for launch on a Soyuz vehicle, Soyuz Flight ST24, that will lift off next week from Baikonur Cosmodrome in Kazakhstan. 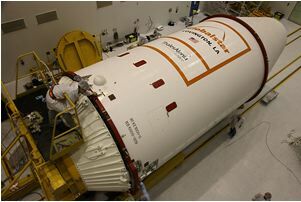 This overhead view shows the ST-type payload fairing after encapsulation of the six Globalstar satellites. These six satellites have been encapsulated in their protective payload fairing during activities in the Cosmodrome’s Upper Composite Integration Facility (UCIF) operated by Arianespace’s Starsem affiliate. The upper composite is now ready for transfer to the MIK launcher integration building, where it will be installed on the three-stage Soyuz using the horizontal assembly process. The December 28 launch will be conducted by Starsem on Arianespace’s behalf, and is the third of four missions contracted by Globalstar to orbit 24 of its second-generation spacecraft for the service provider’s mobile satellite voice and mobile satellite handset data services. Globalstar’s second-generation satellites are trapezoidal in shape and weigh approximately 700 kg. each at liftoff. Built by Thales Alenia Space, they are mounted on a 6.7-meter-high conical-shaped dispenser system that is integrated with the Soyuz’ Fregat upper stage. Once the constellation of second-generation satellites is fully deployed, it will support Globalstar’s mobile satellite voice and data services for commercial and government customers in more than 120 countries. This upcoming launch will use the same basic version of the Russian-built medium-lift workhorse launcher that Arianespace has introduced at the Spaceport in French Guiana, and includes the ST-type payload fairing with a diameter of 4.1 meters and an overall length of 11.4 meters. The previous two Baikonur Cosmodrome missions with Globalstar’s second-generation satellites were performed in July of this year and in October 2010.